Join Higher Ed. professionals in sharing best practices in supporting international students. COST: $5 for NYS TESOL members and $10 for non-members; Free for Adelphi International and Adelphi university staff and students. *Wine and Cheese will be provided. Norwalk, CT (7/27/2017) – English Learner Support Services of Fairfield County is pleased to announce that it has received a $25,000-grant from Fairfield County’s Community Foundation for the “Academic Support Program to Inspire, Reinforce, and Empower” (ASPIRE). ASPIRE was created by ELSS in collaboration with Norwalk Public Schools’ English Language Learner Education Department. The program will begin this fall for high school English language learners (ELLs) entering the school system with limited or interrupted formal education. These students will receive small-group instruction in English and other subject areas by trained ESL tutors during school hours. For example, in place of attending study hall, a student in the program will participate in a tutoring session run by an ASPIRE staff member. The purpose of ASPIRE is to provide academic support during the school day in order to accelerate fluency of English language skills, making high school graduation and enrollment in a post-secondary program a more likely outcome. ASPIRE will contribute to FCCF’s “All Fairfield County Youth Thrive by Age 25” initiative by helping English language learners graduate within four years. They will have greater proficiency in English and other content area skills, which will be necessary to transition to post-secondary academic programs or certificate training programs. The mission of ELSS is to provide educational programs to underrepresented populations in Fairfield County, with emphasis on English language learners. ELSS has also received support from Fairfield County Bank, Pro Bono Partnerships, and Connecticut Returned Peace Corps Volunteers. ELSS, a 501 (c)(3) nonprofit organization, was founded in early 2016 by Norwalk resident Peter Shaker, a former Peace Corps volunteer in Thailand. He is also an Adjunct Professor of English at the University of Bridgeport and Manhattanville College. The organization has been working closely with Helene Becker to develop and implement ASPIRE in Norwalk. For more information about ELSS, visit www.elss-fairfieldcounty.org . To learn about Norwalk’s ELL program, visit www.norwalkps.org/curriculum/k-12_programs/english_language_learner_education . I wish to share with you my free new e-book, Plant Your Dream Seeds: A Way to Grow Hope in Your Life, which can be used by students to express in writing their deepest and hopes and dreams. This book of writing prompts is the latest addition to the interactive books section of MakeBeliefsComix.com and can be downloaded at:http://www.makebeliefscomix.com/eBooks/ Just click on the cover. On its pages students will find writing prompts to help them think about the important things that they want to see happen in their lives. By filling in the pages they will be able to express the many hopes and expectations they have for themselves, for those whom they love, and for our world. International storyteller Laura Simms also shares stories she has culled from different peoples throughout the world about the power of seeds. This book is formatted as an interactive digital journal diary. It allows students to write directly on their computer/tablet screens into the areas with lines on the book’s pages. When they are done typing, they can simply save the document until the next time they are inspired to make new entries. All the e-books published at MakeBeliefsComix are geared to help students think and write creatively as well as help students learn and practice the English language. I welcome your feedback on the books. 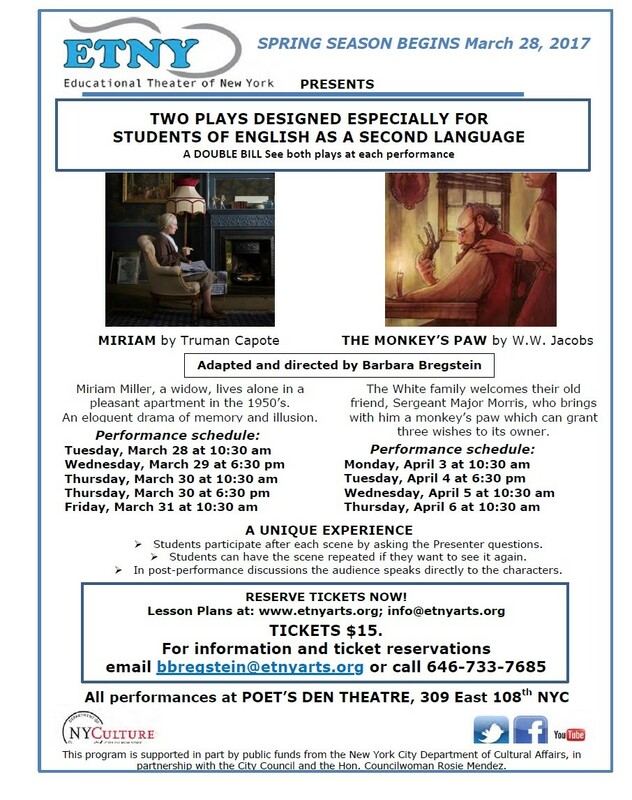 Educational Theater of New York opens its Spring 2017 season with its intriguing double bill: The 1902 classic, “The Monkey’s Paw” by W.W.Jacobs, and Truman Capotes’, mysterious short story, “Miriam.” The plays continue through April 6 with performances at 10:30 a.m. and 6:30 p.m. Designed for English Language Learners, students may ask to have a scene repeated in they wish, and have the chance to interact with the characters in a post-performance conversation. Tickets, $15. Reserve tickets by calling 646-733-7685 or email [email protected]. You can find lesson plans at www.etnyarts.org.